Before our boys started school, we would travel to New Jersey every October to see my husband’s family and enjoy the amazingly gorgeous display of fall colors throughout the countryside. While there, one of our favorite traditions was to go apple-picking together. It was such a treat to pick an apple right off the tree and eat it! Of course, we’d come back with barrels of apples and that’s when the fun would really begin … coming up with all kinds of delicious ways to enjoy our bounty of apples! Since then, we try to make a yearly trip during Thanksgiving break. Unfortunately, apple season has passed and all of the beautiful leaves have fallen from the trees. However, our favorite family-owned apple farm is still open, selling their scrumptious fresh-pressed apple cider and lots of fresh-baked apple treats. 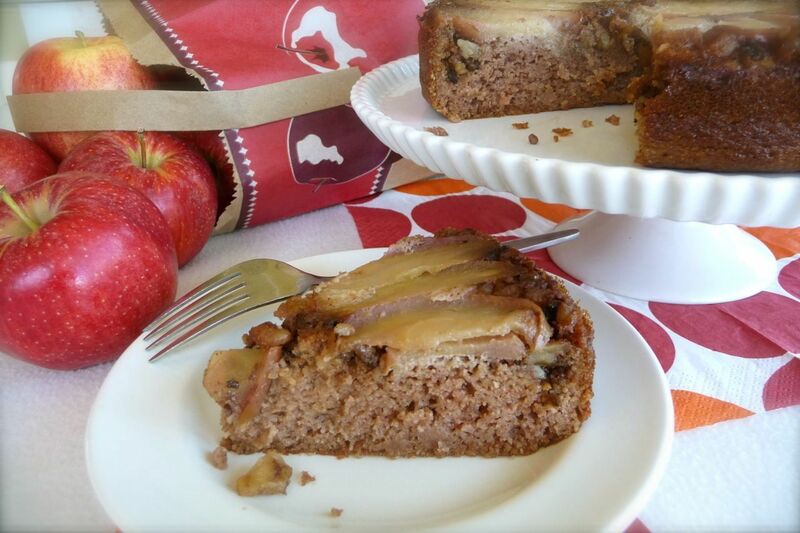 Inspired by their delicious apple creations, I developed this delightful grain-free apple streusel upside down cake. It’s like having a little slice of fall each time I bake it! 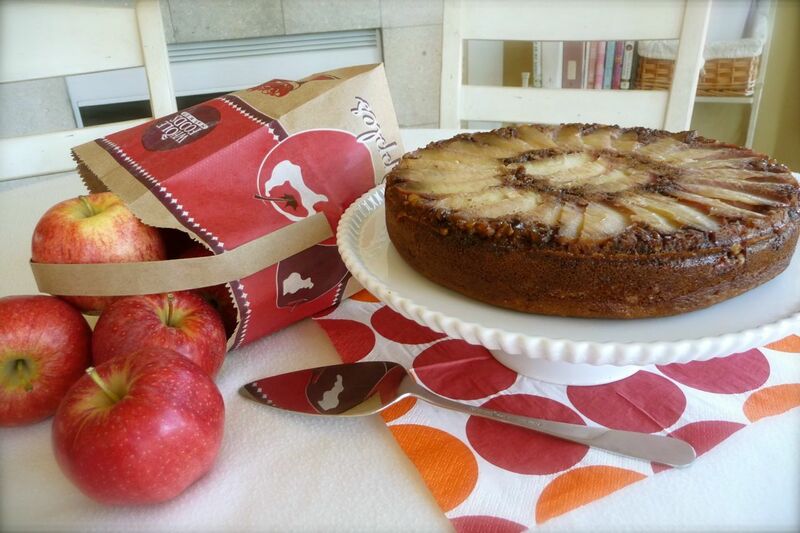 As shown below, to make this cake as pretty as it is tasty, arrange the apple slices in a pleasing pattern on the bottom of a springform pan. Then, spoon the walnut mixture in a circular pattern across the top of the apple slices, filling in the gaps between the apple slices. Beautiful and delicious! Step Two: Prepare Topping – Core and slice one apple (about 1/4 inch slices) and arrange the apple slices in a pleasing pattern on the bottom of the prepared pan/baking dish (as shown in photo above). In a small bowl, combine the melted butter, rapadura (sucanat) and cinnamon. Then toss the walnuts in the mixture until well coated. 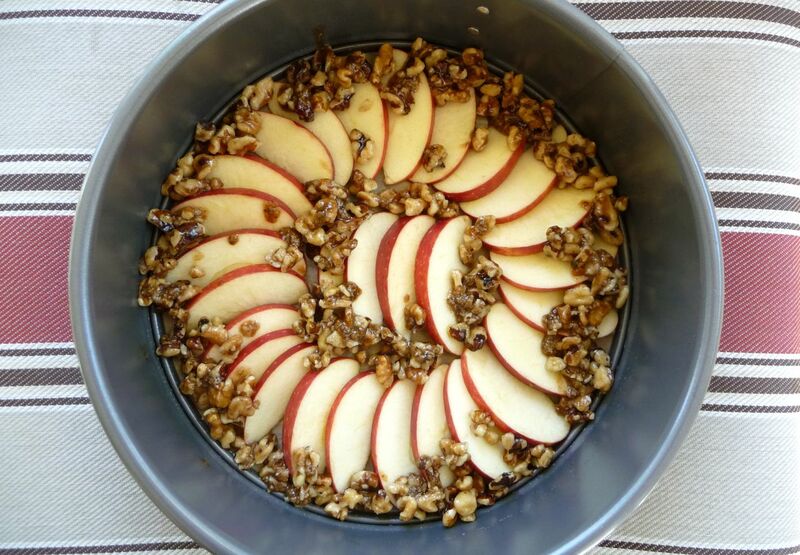 Spoon the walnuts in a circular pattern across the top of the apple slices, filling in the gaps between the apple slices (as shown in photo above). Place the pan in the oven and bake the topping for 6-8 minutes, just until the apples begin to soften. Then remove from oven and add the cake batter, as described below. Step Three: Prepare Cake Batter – While the topping is cooking, prepare the cake batter. In a small bowl, combine the almond flour, baking soda, salt and spices. Set aside. Using an electric hand mixer, blend (on low speed) the applesauce, maple syrup, eggs and vanilla, until well combined. Slowly mix the dry ingredients into the wet and continue mixing for a full minute, until smooth and well blended. Gently pour the cake batter over the partially baked apple topping, using a rubber spatula to help remove all of the batter from the bowl. Spread batter evenly across top. 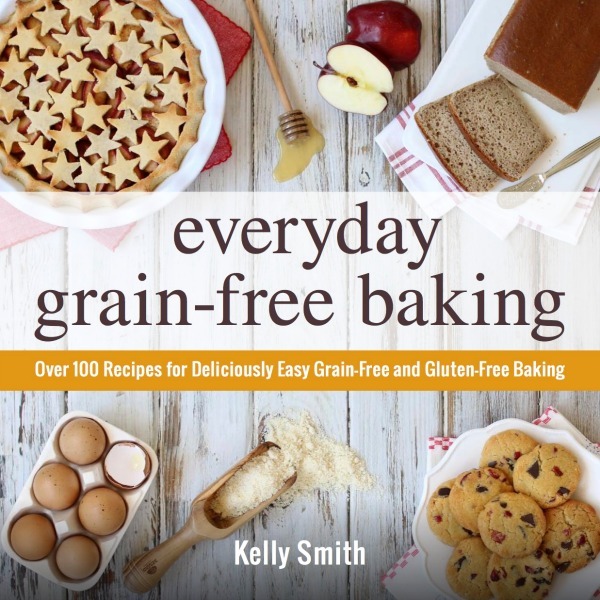 I would like to use coconut flour Kelly. Do you know amount? Mahalo! OK. Yum! This looks great. We are just beginning to cut out grains and I am sad to miss our favorite apple cake, but this looks like a good replacement. This looks great! Do you know if honey or possibly another sweetner could be used to replace the Maple Syrup? I live in South Africa and Maple syrup is hard to find. Thanks! Just shared on FB :-)! Beautiful ! Can you replace the almond flour with coconut flour? I should think it would be easier than a whole wheat alternative, least I hope its cup for cup. Thank you very much Kelly … I had hoped it would be simpler but thought it may not be LoL. Take care and blessings for the Holidays and New Year. Thanks for the yummy recipe! Quick question for you. You may not know the answer, but figured I would ask. Any idea how flaxseed would work in place of the eggs? Obviously it wouldn’t be as fluffy. Just wondering if you’ve tried it or have talked to anyone that’s tried it with an egg replacer. Hi, I just tried this recipe tonight and it was absolutely delicious!!!! I did substitute coconut nectar for the maple syrup because the coconut nectar has a much lower glycemic index and more easily digested. This was the very best cake that I have tasted, bar none. Thanks for sharing this recipe. It will be a favorite of ours from now on. Keep up the great work and God bless you and your family. This is one of our favorites!! I use coconut nectar (brand: Coconut Secrets; reason:it has a MUCH lower number on the glycemic index) instead of the maple syrup. It was delicious!! I’m sorry I just noticed that I had already sent this tip. I must of had a “senior moment”. Sorry. What difference might it make to use non-blanched almonds or soaked and dried almonds? Bitter taste? Pasty? Just fine? Hi, Jennifer. Blanched almond flour is quite different than almond meal (ground almonds with the skins left on). Blanched almond flour is finer and so the result is a lighter, fluffier baked good. Almond meal (with skins) is not as fine of a grind and is a coarser meal so it results in a heavier baked good. I only use blanched almond flour so the measurements in this recipe for both the almond flour and liquids/other ingredients are all based on the best result for this particular flour (blanched almond flour). If you opt to substitute, I cannot of guarantee the results, since I haven’t tested other flour options. OH my heavenly stars!!! This recipe is amazing! I used peaches instead of apples with puréed peaches for the apple sauce. Amazing! I decreased S the baking soda to 1/2tsp, it still turned out beautifully. Thank you for such a yummy treat!